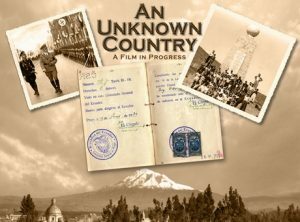 An Unknown Country is an independent film that tells the story of those who fled Europe escaping the Nazi terror to find refuge in an unlikely destination: Ecuador, a small South American country barely known at the time. 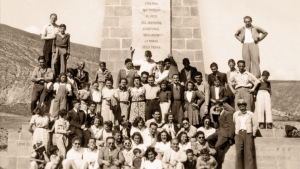 Featuring first hand accounts and archival material, the story opens a window on the exiles’ perilous escape and difficult adjustment as they remade their lives in an unknown land. Through the exiles’ personal testimonies, the documentary chronicles their heartbreaking search for a country that would take them in when most had closed their doors. It sheds light on why Ecuador, a small country with few resources, granted asylum to the refugees. It also explores the actions of Ecuador’s consuls in Europe: some exacted heavy fees for visas, others helped for humanitarian reasons. One consul daringly issued Ecuadorian passports to stateless refugees to delay deportation. For his life-saving efforts, he was honored posthumously in 2011 by Israel’s official memorial to the victims of the holocaust. The film will provide fresh insights as it relates the refugees’ struggles to build new lives and hold on to elements of their European culture in what was for them an exotic, unfamiliar land. It explores the relations between the local inhabitants and the European immigrants in their midst, and highlights the contributions the immigrants made to the economic, artistic, and social life of their host country. In the present day we follow Ecuador’s small Jewish community as it unveils designs for a monument to honor the humanitarian consul. The children of the refugees — now living abroad — return to Ecuador, the land of their birth. During this reunion, they reconnect with childhood memories and rediscover the unique and peculiar aspects of living in the country that welcomed their parents.